This recently acquired tractor has been sitting for 4 years and I have mended the frozen three point linkage and cleaned the diesel engine which runs well, However when I run the engine and move the lever to forward or reverse the engine dies. I have reason to believe the clutch plates are stuck. I have tried most things to free the plates, driving down hills etc but no good. IF I have to open the clutch do I take the motor away from the clutch casing OR take the gearbox away from the clutch casing ? Does the gears grind when you put it in forward or reverse? if not, then I would suspect one of the 'Safety' switches is shutting down the motor. it may have a safety switch going to the seat, I am not familiar with that model. it may be why it was sitting for 4 years. One way to check is to find the fuel shutoff solenoid and put a meter to it. Check if voltage drops to 0 or rises to 12 when the forward reverse shuttle is engaged. be sure to take it out of gear so it does not move on you. Found article describing what I understand from what you said. I may be wrong in my interpretation. That's when I found out that the seat switch circuit shares a fuse with the ehss circuit, so with the engine now running and that factory fuse blown, the tractor would not move, because the ehss was inoperable. The gear shift does make a grinding noise and does not let me put it into gear, even from the down hill position. Interesting about the seat because I removed it, since it was rusted out. I will try neutralizing it first, and also check the pump volts. Thanks. 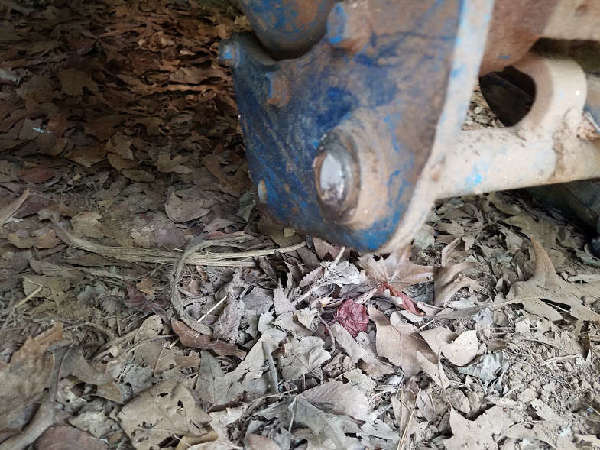 I did find out that if, as I believe, it is the clutch stuck after more than 3 years without that wood toggle under the foot pedal, I need to break the tractor from inside the transmission, not from the engine itself. A dry clutch seems a bit archaic design for a working tractor.! Keep the tractor shut off. Jack up one rear wheel. put transmission in the highest gear, lock the clutch pedal down or have someone sit on the tractor hand hold it down. disengage the pto so it spins free. then stand at the tire that is off of the ground, gently bump it back and forth. It may take a while but this may work the clutch loose. you may need to do the same thing with the PTO if it has a clutch involved in this also. If it has the optional electro hydraulic shuttle shift trans. check the trans oil level, if it is full and you live in a cold area check if the oil is milky from water because cold milky oil will not go through the filter, the oil and filter needs changed, if it still doesn't work did someone drive it with the brakes on? If so brake dirt is blocking the filter, change the oil and filter. t sounds like the input shaft that splines into the clutch drive disc on the flywheel is damaged. This will cause the transmission to stop moving, the PTO to quit and the hydraulics to stop. The tractor has to be split in half at the engine to bell housing to fix. Most TC55DA have hydraulic shift trans in them. Yours probably does as well. One reason this happens is running a rotary cutter or some implement with a great deal of momentum to it. When you shut the PTO off, there is no over-running clutch in the trans. This causes a load on the powertrain, which snaps the input shaft off or damages the splines on it. An external over-running clutch on the PTO shaft will help. Great news. I went through all the fuses and wire join ups and after joining the seat safety wires together, tightening up a starter wire, the tractor started better and all my problems were solved. My grateful thanks to arcwelder for answering and recommending so many checks. I certainly never expected that the tractor would not go into gear because I was not sitting on it. Not like my old Ford 8000 ! I have learned to never underestimate Murpy.